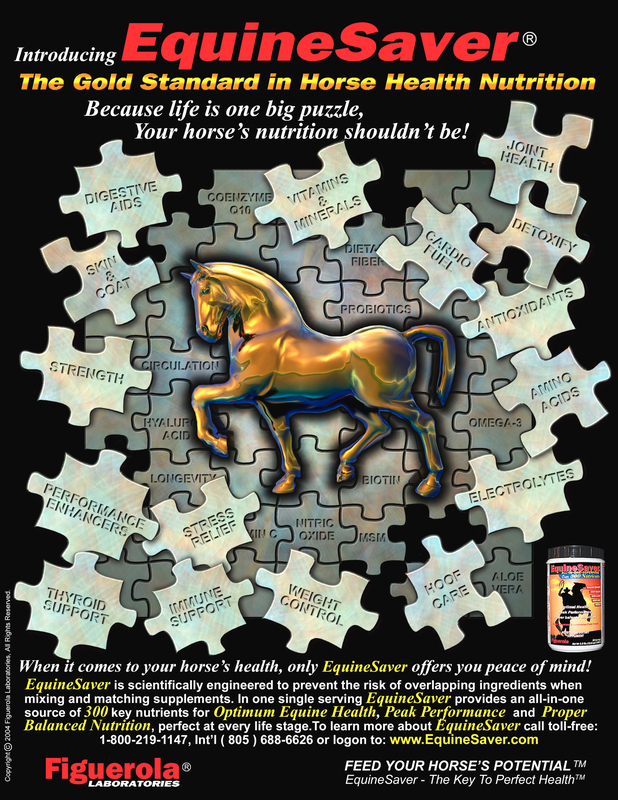 EquineSaver is a complete all-in-one superfood for total equine health and well being. Targeting challenges to your horse's health from illness and injuries and acting as an essential therapeutic to help promote healing. Administer 1 scoop twice daily. For sports training, athletic competition, or recovery from injury and surgery, administer 1 - 3 scoops twice daily. Organic Flax Seed, Organic Flax Oil, Stabilized Rice Bran, Gamma Oryzanol, Dimethylglycine (DMG), Multi Vitamin Complex, Mineral Complex (Coral Calcium, Magnesium, Methylsulfonylmethane (MSM), Glucosamine HCl, Low Molecular Weight Chondroitin Sulfate, Hyaluronic Acid), GlycoElastin™ (Hydrolyzed collagen, Type-I Collagen, Type-II Collagen, Type-III Collagen, Type-B Collagen and Chicken Collagen Type-II; naturally occurring Glucosamine Sulfate (12%), Hyaluronic Acid (24%), Chondroitin Sulfate (20%), Methylsulfonylmethane (MSM), Sadenosylmethionine (SAMe)), Glutathione, Alka-Fortis™ (Iso Rhynchophylline, Uncarine C (Pteropodine), Uncarin F, Iso Mitraphylline, Speciophylline, Rhynchophylline, Otundifoline, Keto Uncaric-Acid, Mitraphylline, Oleanolic Acid, Oxogambirtannine, Beta-D-glucopyranosyl ester, quinovic acid 3 beta-O-beta-D-quinovopyranoside, Rotundifoline, Stigmasterol and Ursolic Acid), Olive Leaf Extract (10:1), Conjugated-Linoleic-Acid (CLA), Gamma-Linoleic-Acid (GLA), DHA, S-Adenosyl Methionine (SAMe), Dimethylethanolamine (DMAE), Chlorella, Alpha-Lipoic Acid, Glycerol, Inositol, Inositol Hexaphosphate (IP6), Omega 3 Fatty Acid, Omega 6 Fatty Acid, Omega 9 Fatty Acid, Quercetin, Marigold, Hypericum Perforatum, Zeaxanthin, Pygnogenol, Aloe Vera, Cape Aloa, Horse Tail (7% Silica), Sea Vegetable Complex (Alaria Esculenta, Ascophyllum Nodosum, Bladderwrack (0.2% Iodine), Dunaliella Salina, Eclonia Radiata, Kelp, Kombo, Laminaria Japonica, Lithothamnion Calcerum, Macrocystis Pyrifera, Spirulina (Blue green Algae)), Ribose, Organic Rice Bran Oil, Hemp Seed Oil, Borage Oil, Sesame Seed Oil, Sunflower Oil, Pumkin Oil, Grape Seed Oil, Silver Protein, Gallium, Nopal (Mucilage & Pectin), Psyllium, Mushroom Complex (Agaricus Blazei, Blakeslea Trispora, Cordyceps Sinensis, Ganoderma Lucidum, Grifola Frondosa (Maitake), Hericium Erinaceus, Lentinula Edodes (Shiitake), Polyporus Umbellatus, Poria Cocos, Trametes Versi, Tremella Fuciformis), Organic Pumpkin Seed, Licorice Root, Ilex Paraguayensis, Lecithin, Nettle (4:1 Extract), Kiwicha, Gotu Kola (20% Triterpenes), Organic Sesame Seed, L-Glutamic Acid, Lepidium Meyenii, Potassium Bicarbonate, Organic Quinoa, Pentahydroxine™ (Sea-buckthorns Extract, Gynostema Penthaphyllum (Gypenosides 80%), 20:1 Gynostema Penthaphyllum, Sedum Crenulata Root Extract, Lepidium meyenii (0.5 Beta-Ecdysone), 4:1 Morinda Citrifolia Extract, Mnagosteen, Goji Berry, Burdock Root Extract, Spirulina, Pinus Maritima and 80% Ginsenosides (Panax Ginseng)), Phyllanthus Niruri, Cryptocarya sp, Morida Citrifolia Juice Extract, Saw Palmetto Extract ( 9% Schisandrins), Siberian Ginseng Root (80% Ginsenosides), Zingiber Officinale (5% Gingerols), Don Quai Root (7% Silica), Annona Muricata, Cyclanthera Pedata, Velvet Antler, Boswellia Serrata, Sea Cucumber, Lycopene, Huperzine-A (Huperzia Serrata), Nitric Oxide Enhancers (Zizpy Fructose, Cordyceps Sinensis, Gynostemma Pentaphyllum Extract), Phosphatidylserine, Uva Ursi (20% Arbutin), Equisetum Hyemale, Rosehips (5:1 Extract), Black Elder, Royal Jelly, Pau d’Arco Powder, Green Tea Extract, Kaniwa, Hawthorne Berry, Grape Seed Extact, Ginkgo Biloba, Myrciaria Dubia Extract, Pueraria Root Extract, Perna Mussel, Red Clover (8% Extarct), Pine Bark (95% Proanthocyanidins), Organic Sunflower Seed, Rosemary Extract (5:1 Extract), Yucca (4:1 Extract), Cymbopogon Citratus, Orange Peel, Echinacea Root, Maytenus Ebenifolia, Goldenseal (30% Alkaloids), Gymnema Sylvestris, Avena Sativa, Phytates, Curcumin (95% Curcuminoids), Fenugreek (25:1% Extract), Carotenoids, Wild Yam Extract, Melatonin, Chuquiraga Spinoza, Thyme, Peppermint, Flavonoids (Alfalfa, B-Rutinoside, Broccoli Concentrate, Cheilanthes Myriophylla, Cyclanthera Pedata, D-Glucarate, Dandelion Root Powder, Geranium Dielsianum, Gold Garlic, Hesperidin, Hops, Labiatae Extract, Naringenin, Naringin, Slippery Elm Bark, Spinach Powder, Syzygium Aromaticum, Vitex Agnus Castus), Fruit Blend (Apple, Apple Juice Concentrate, Apricot, Banana, Black Currant, Blueberry, Cherry (white, red, & yellow), Cranberry Juice Concentrate, Elderberry, Granadilla, Grape, Grapefruit, Lemon, Lima, Lime, Mango, Nectarine, Orange, Papaya, Passion Fruit, Peach, Pineapple, Pomegranate, Pomegranate Juice Concentrate, Prune Juice Concentrate, Strawberry, Tamarindo), Bixa Orellana, Cymbopogon Citratus, Geranium Dielsiana, Silymarin, Plantago Mayor, Chlorophyll, Red Wine Extract, Red Rice Yeast, PURPUREX (Purple Corn Extract), Nutritional Yeast Culture, Potassium Bicarbonate, Artichoke Powder, Jerusalem, Ho Shou Wu Root, Broad Bean, Burdock Root, Bilberry Extract, Cheilanthes Myriophylla, DEWORMER, Croton Lechleri Resin Extract, Velvet Antler, Red Yeast Extract, Phytoplankton, Zooplankton, Earth Elements (Neodymium, Erbium, Niobium, Scandium, Praseodymium), Enzymex™ (Protease, Lipase, Amylase, Cellulase, Sucrase, Pancreatin, Invertase, Maltase, Lactase Papain, Plantain, Pectin and Bromelain), Biothil™ (Bifidobacterium Bifidum, Bifidobacterium Breve, Bifidobacterium Longum, Fructooligosaccharides (FOS), Lactobacillus Acidophilus, Lactobacillus Bifidus, Lactobacillus Brevis, Lactobacillus Bulgaris, Lactobacillus Casei, Lactobacillus Lactis, Lactobacillus Plantarum, Lactobacillus Rhamnosus, Lactobacillus Salivarius), Vanilla Bean, Cinnamomum Aromaticum, Pimpinella Anisum, Electrolytes, Natural Sweeteners (Apple Juice Concentrate, Beet Pulp Juice Concentrate, Fig Juice Concentrated, Prune Juice Concentrate, Stevia Extract, Zizyphi Fructus). My horses and healthy and happy! I have five horses and they each get a large scoop of Equine Saver along with their senior feed and love it. They are shiny, healthy and the best part about Equine Saver is that all the supplements are in one container. I wouldn't feed without it. For years I tried to keep my thoroughbred barefoot. Off his shoes would come and then back on they would go because he would get so sore. Started him on EquineSaver, after 6 months told my farrier I wanted his shoes off. She was so angry with me. After 6 weeks of no shoes and no soreness, frogs in great shape, my boy was a happy camper without his shoes! My farrier ate her words! 2 years later and still no shoes!! I have used Equinesaver for my 2 Arabians for many years and love it. I think all the ingredients have kept my now 24 yr old with excellent joints. He is very agile still. Best supplement I have ever used. I love this supplement. I have multiple horses; broodmares, performance horses, and schooling horses. All of my horses are on this supplement. We live in Alaska where there is a significant percentage of horses that have vitamin deficiencies due to having to feed hay majority of the year instead of grass. None of my horses have ever tested for vitamin E or A deficiency. And I get constant comments from my vet and farrier about how well they look. Their coats look beautiful; even their winter coats. Their hooves are healthy, and so are their joints. Though I use joint saver on the older ones. I will continue to use this product for as long as I have horses. This product does exactly as it claims! My 5 yr old AQHA is doing great on this product. We tried EquineSaver on the recommendation of our vet for one of our older geldings who was having joint problems and losing weight (and spark). Before EquineSaver, we had to keep him on bute daily, just to keep him going, and were sure he wouldn't make it through another winter. That was three years ago! After a few weeks of EquineSaver, we were able to take him off the bute. And within the year, he was trotting out to the pasture with his buddies. While he'll never be young again -- or even sound enough to ride -- we've seen a truly amazing difference and are enjoying the extra years we're getting to spend with our old pal. I volunteer at a rescue-HB came in starved & at the point of death. The first month was devoted to feeding her up & then we put her on Equine Saver. She blossomed with this supplement. Her coat is shinny and her hooves are strong. She is barefoot and the hooves do not crack or chip. HB is 22 years old she is now ridden and acts like a 6 year old. Great product! My rescue horses have been on EquineSaver for years. They see their vet for a yearly visit and shots only. This product provides most of your horses vitamin/supplement needs. Once a year I tapeworm but the rest of your horse needs except for food, water and love are provided with this product. I live in an area which has a lot of sand and I have not needed to use any other products since bringing EquineSaver into our lives.